Howard M. McCollister, M.D., F.A.C.S. Dr. McCollister graduated from the University of Nebraska-Lincoln and earned his Medical Degree at the University of Nebraska College of Medicine in Omaha. He completed his surgical internship and residency at the University of Nebraska Medical Center. He is a Fellow of the American College of Surgeons and is a member of the American Society of Laparoendoscopic Surgeons and the Society of American Gastrointestinal and Endoscopic Surgeons. He is also a member of the American Society of Metabolic and Bariatric Surgeons and currently serves as Past President of the Minnesota Chapter, a group that he was instrumental in creating. 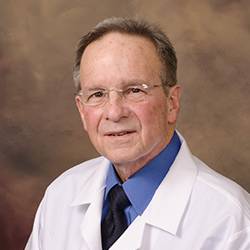 Dr. McCollister has practiced Surgery at Cuyuna Regional Medical Center since 1987. He has served as Chief of Staff, and has been the Chief of Surgery for the majority of those years. He currently still serves in that position. He has been a member of the CRMC Leadership Council since its inception. He is the Co-Director of the Minnesota Institute for Minimally Invasive Surgery (MIMIS) and is the Director of the MIMIS Bariatric Division. He has been the Medical Director of Emergency Medical Services at CRMC. He was the founder and Medical Director of the Crow Wing County Sheriff’s Department Tactical Response Team and is presently the Medical Director of the CWCSO Bomb Squad. Dr. McCollister was the Assistant Coroner for Crow Wing County for over five years. Dr. McCollister is an experienced and dedicated educator and is the Associate Program Director of the MIMIS accredited Fellowship in Advanced Minimally Invasive Surgery, Bariatric Surgery, and Flexible Endoscopy. Dr. McCollister is one of the most experienced Laparoendoscopic, Bariatric, and Reflux Surgeons in Minnesota.